Today is National Ag Day, a day set apart to celebrate agriculture in our country. National Ag Day began forty-four years ago as a way to spotlight all the great work farmers and ranchers do to feed and clothe the United States and the world. I am privileged to be part of 2% of the population, each of us responsible for feeding roughly 168 people in the US and abroad. 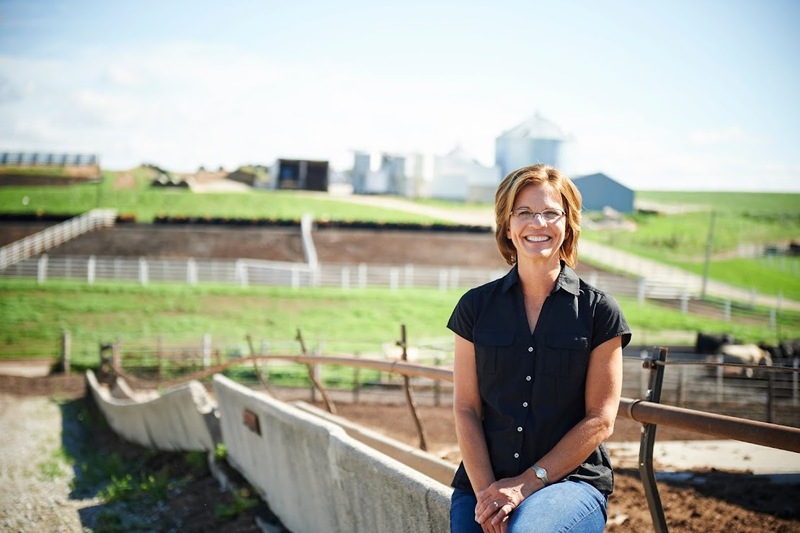 I am also privileged to know many farmers and ranchers across the country and in this blog I would like to put the spotlight on women in agriculture. I will focus on these farm women in three arenas that have impacted me the most. 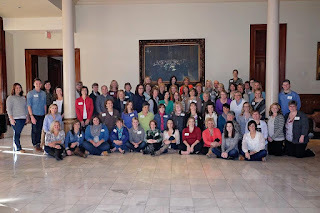 Ten years ago I was invited to meet with a group of women from northeast Nebraska to discuss the idea of having a one-day conference for women in agriculture. Thanks to the vision of Bonnie Schulz our brainstorming session led to a conference that has been filled to capacity for the last eight years. Our committee has changed but the passion of the women on the committee has not. We have been dedicated to offering quality key note speakers, educational break out sessions as well as very cool swag gifts for each lady attending. Each woman on the committee brings unique gifts that I believe have been the key to the success of the conference. We've spent hours outside of the monthly meeting preparing table decorations, assembling binders, stuffing bags and soliciting sponsors. We've laughed and cried with one another as weddings are held, babies are born and loved ones that have died are mourned. We are truly a committee that seeks to educate, motivate and celebrate women in agriculture! is open so far unless my Ag-Ceptional friend, Karen Grant, just poked me!! 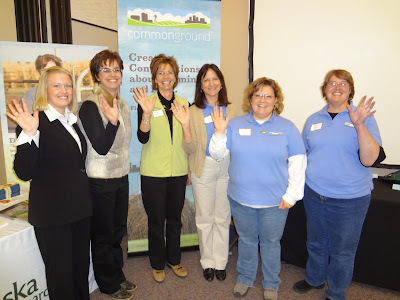 Seven years ago I attended a session to train women in agriculture about having conversations with consumers about how food is raised. 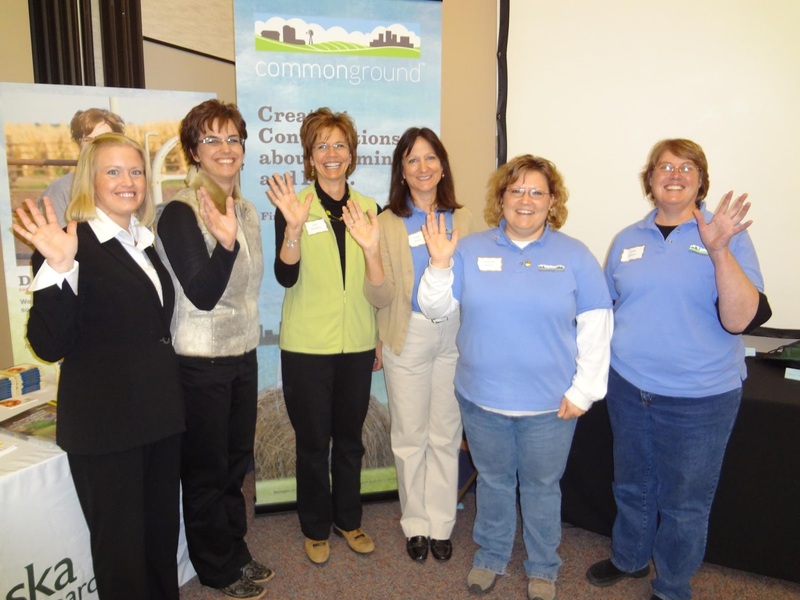 CommonGround volunteers are women in agriculture with a passion for sharing a positive story that is personal, credible and very real. The beauty of CommonGround is that we are encouraged to share our own story that is based on lived experiences and facts versus rumor and fear. When I have conversations with consumers I can answer concerns about cattle in the feedlot and using GMO crops. Other volunteers talk about areas of expertise on their farms that include dairy, pork, poultry and organic farming. As volunteers we also learn from one another about the work we do to increase our own understanding of how food is raised. We are blessed with an incredible staff of people that find opportunities for us to engage in conversations with consumers and continually challenge us to grow in our communication skills. I encourage you to meet the women of CommonGround by visiting the national and/or state websites. These women in agriculture would love to reach out to you on Ag Day and every day to connect you to their farms via their stories and your questions. I consider myself very blessed to be a part of the CommonGround family and the impact we are having on helping consumers base their food buying decisions on facts, not fear. with consumers please consider joining us. Four years ago I was appointed to the Cattleman's Beef Board. I am one of about one hundred board members appointed by the Secretary of Agriculture to oversee the collection of $1-per-head on all cattle sold in the U.S. and $1-per-head equivalent on imported cattle, beef and beef products. Previous to this appointment I had not been involved in leadership at the state or national level for the beef community. Little did I know that I was about to meet some of the finest women in agriculture. A rancher from Oklahoma, Terry Wyatt, took me under her wing right away and has continued to be a respected mentor and friend. A rancher from Florida, Sarah Childs, has given many laughs over her alligator catching stories. I learned much about co-chairing a meeting by working with rancher Dianne Kirkbride, from Wyoming. I have watched women like Kim Brackett from Idaho and Anne Anderson from Texas lead the board as dedicated chairwomen. Anne is especially dear to me because it was she that asked me to consider running for an officer position. There are many more women that I have met through my time serving on the beef board that I will treasure forever. These women all share a love for the beef community, dedication to continuous improvement and sincerity that builds lasting bonds between friends. as well as spend time visiting about our families. National Ag Day is a great opportunity to focus on what is really good about agriculture in our country. We have hard working men and women dedicated to raising wholesome food for your family that you can learn more facts about here. The often unrecognized contributions of women to food and fiber production are changing as more young women seek careers in agriculture. As a woman in agriculture I salute my fellow ag women on this National Ag Day! “She sets her mind on a field, then she buys it; with what her hands have earned she plants a vineyard. She puts her back into her work and shows how strong her arms can be. She knows that her affairs are going well; her lamp does not go out at night. She sets her hands to the distaff, her fingers grasp the spindle. She holds out her hands to the poor, she opens her arms to the needy. She is clothed in strength and dignity, she can laugh at the day to come. When she opens her mouth, she does so wisely; on her tongue is kindly instruction. She keeps good watch on the conduct of her household, no bread of idleness for her. Today is International Women’s Day. According to some internet searching this annual celebration on March 8th goes back to 1908 and the struggle for women to get shorter work hours, better pay and the right to vote. I am grateful that I have the right to vote. I do believe women were made for more than protests encouraging women not to show up for work on March 8th to highlight the IWD movement. I believe women were made for more by the character developed versus the job they do. I would like to take this day to highlight a few women that have shown me in a variety of ways what it means to be a woman that is made for more. Barbara was born in 1938 as a twin and the youngest of five. Barbara would grow up a city girl with summers spent on a ranch in Valentine. She met a tall, handsome man, that she would marry and raise six children with. Barb, as she was known by friends and family, moved with her husband to Washington State while he finished his military service. She became pregnant with her first child and about half way through the pregnancy received word that her mother had died suddenly. 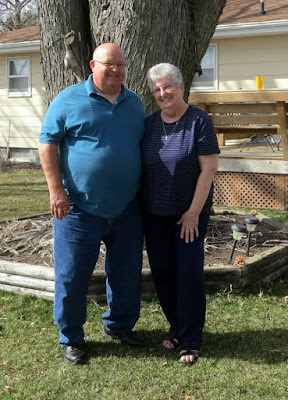 The couple borrowed money to get back to Nebraska for the funeral. It would only be several years later when her father would die suddenly, too. 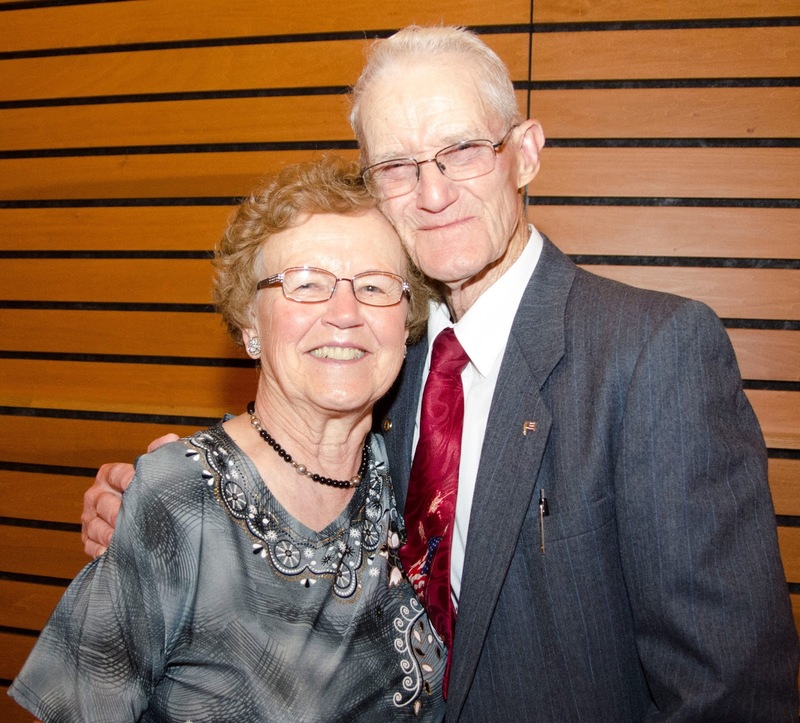 Barb would continue to experience more grief as she lost each sibling one by one and then most recently her husband. I am amazed at the amount of sorrow she has endured and recently learned her birthday is also the feast day of Our Lady of Sorrows. Aside from the difficult times Barb also encouraged her children to get involved in Brownies, Girl Scouts, Boy Scouts and 4-H. Barb taught religious education and sold toys for Brandeis to the delight of her children who liked to see what other kids were getting for Christmas. Birthdays were special days in the family and each child was blessed with a decorated cake decorated by Barb. Barb was also known for her fried chicken and sewing skills. One Christmas she made her daughters numerous Barbie outfits during the night hours so the girls would not see what she was making. Barb nourished her family first with the gift of life and second in countless ways of showing how much she cared for each one of them. Barb is known for making sure you are fed well when visiting! Barb is my mom and I am so very grateful that she chose life for me and my five younger siblings as well as modeling her virtue of generosity. 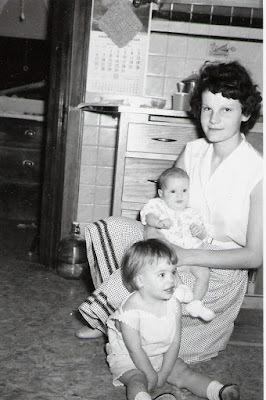 Kathleen, also known as Aunt Kathy, was a very dear aunt to numerous nieces and nephews. 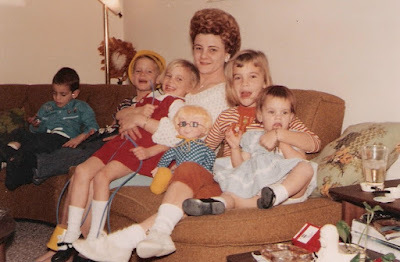 Aunt Kathy loved to bring gifts, bake lots of food and spend time with extended family. Aunt Kathy and her long time boyfriend, Gene, took me to see Mary Poppins in the theater when I was about six years old. Aunt Kathy hosted numerous family gatherings including a Christmas party where I remember many of the girls receiving a Mary Poppins doll and each child received a special bank that had a $1.00 bill in it! Aunt Kathy was the first person to hear about my encounter with Steve at a wedding dance in Snyder. Aunt Kathy nourished family and friends with her laughter, her love and her ability to make you feel welcome. I am very grateful to have had an aunt as precious as my Aunt Kathy. Aunt Kathy is surrounded by my siblings and I-late 1960's. Juanita, also known as Aunt Juanita, remains a very dear aunt and friend of mine. Juanita was married to my dad’s youngest brother, Melvin. Juanita has a voice that oozes kindness and love. When I was going through some rebellious teenage years Juanita was there to give me her comforting smile and a place to be loved. 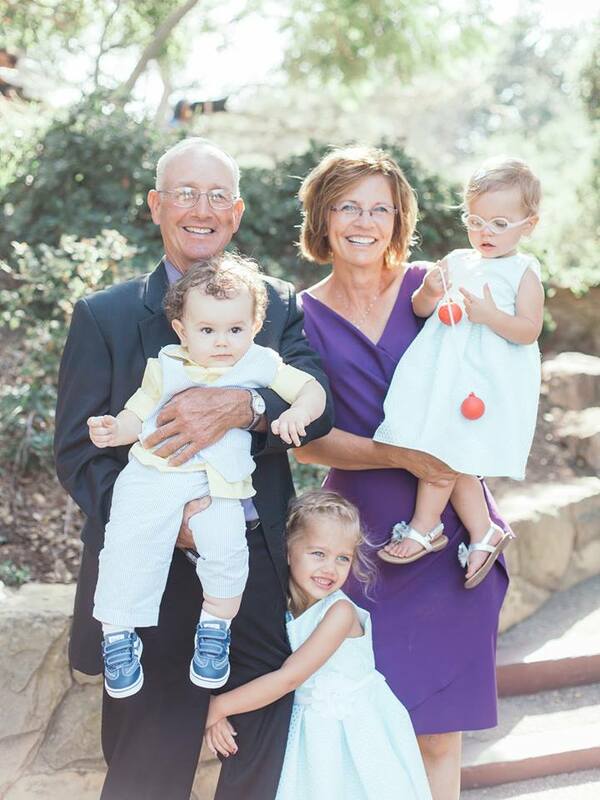 When my uncle was diagnosed with cancer our families went through a difficult time. Juanita has continued to be a close friend for my mom and our family with her soft, warm, kind and loving voice. I am very grateful to have Aunt Juanita as an example of accepting each person as they are with great love. Juanita and her husband, Paul, sharing an Easter with us. Bernardine, also known as mom to my husband, is the oldest of eight children and the mother of ten children. I met Bernardine on my first visit to see Steve when I followed up on his invitation to come out to the farm to ride his amazing horse. I found Bernardine to incredibly gifted at sewing, baking, gardening and listening. Bernardine has always been very good at paying attention to details which makes one very good at making quilts, baking bread, canning tomatoes and building life-long friendships. Bernardine also loved reading to our children when they were young and making them special pajamas and pillow cases to match their interests. 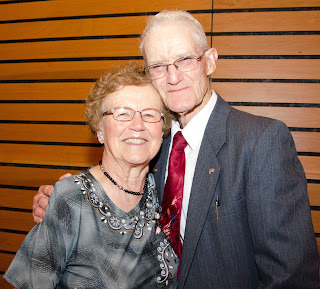 Bernardine has been an incredible mentor of loving each and every life God gives you. Bernardine has nourished family and friends with her numerous apple pies and loaves of homemade bread as well as countless baby quilts made for Project Linus. I have been blessed to have a mother-in-law I can look up to and admire. 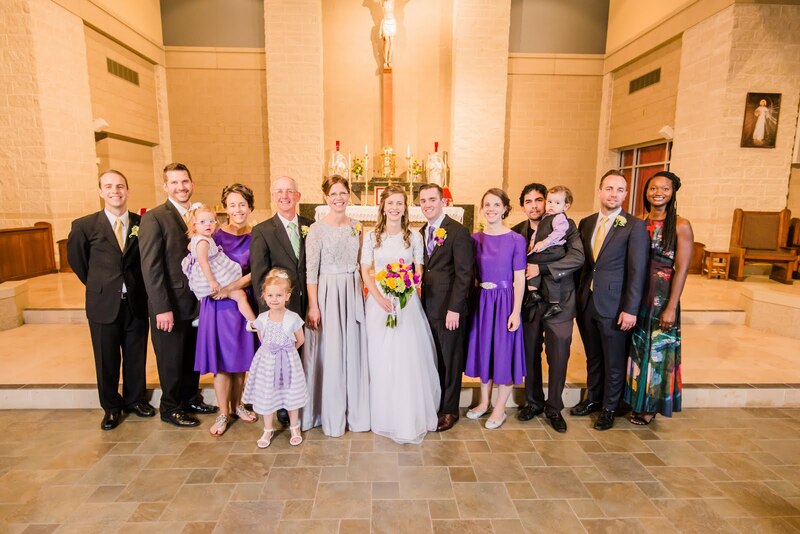 Bernardine and Francis at Emily's wedding in 2014. Linda, Sharon and Sandy are my sisters. I have fond memories of playing Barbies, building snow tunnels and going roller skating when we were kids. As we grew we each found our own gifts and talents, married, faced different struggles and three of us had children. What I admire about my three sisters is the grit they have maintained through a variety of times of suffering. Each one of them has nourished me through their witness of the virtues of courage, forgiveness, generosity and kindness. I am very grateful for my sisters, Linda, Sharon and Sandy and the many ways they continue to bless me with their friendship. 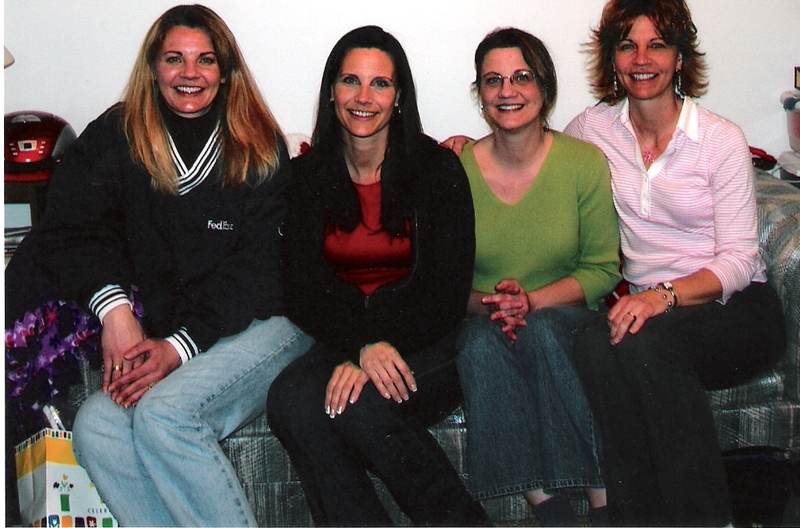 My sisters-Sandy, Sharon, Linda and me in the early 2000's. Steve and I have five children that include three girls. Ginger, Emily and Kim are each five years apart and spent their childhoods playing in trees near the house, climbing hay bales in the barn and taking care of 4-H animals. Each of the girls found a love for raising rabbits after Ginger brought home her first Dutch rabbit. I could write endless stories from the memories I fondly treasure of each of them as a little girl. What I find myself thinking about more these days is how incredible each of them are as adults. Ginger and Emily are both amazing mother’s. All three of the girls are dedicated to jobs that involve teaching. My three daughter’s nourish me with kind words written in special cards, phone calls at random times just to talk and the virtues of love and generosity they give to family and friends. I have been extremely blessed to have three daughters that love me, encourage me and support me in my own new adventures. Kim, Ginger, Emily, me and Ella at Emily's wedding. I have been blessed to have so many incredible people in my life to call friends. There are my childhood friends, cousins that became friends, high school and college friends, friends I met when I moved from one town to another eventually settling in Dodge and friends I continue to make through volunteer opportunities. I have recently been blessed with an overwhelming amount of love from many friends since the passing of my father. I do have one friend I would like to mention because she was also a mentor that taught me a lot about being a woman. Her name is Joyce Kreiekemeier. I met Joyce through church activities. Over several years of time I watched and learned from Joyce about servant leadership, poise, commitment, dedication and love. Joyce treated me like an equal even though she had many years of experience and knowledge beyond mine. Joyce also encouraged by example, taught through teamwork and lived joyfully from a faith was from deep within her heart. As I spent time with Joyce I learned to treasure traits like modesty, integrity, perseverance, respect, acceptance and forgiveness. I am so grateful to have had Joyce as a mentor and friend early in my life as a mother to learn the importance of continually growing in faith. As you can see I have been blessed with many women in my life that have nurtured me, encouraged me and loved me. These women have taught me that I was made for more than the job I hold. Who are the women in your life that have blessed you with their friendship and ability to help you become a better person? I believe women were made for the ability to bring life into the world not only through the birthing process but also in the way we can nurture others through our words, our actions and our love. Protest if you must but remember there are those of us who chose instead to give life today by feeding the hungry, giving words of encouragement to our neighbor, treating a patient, caring for our animals, building a home, putting out a fire, hugging a child, nursing a baby, flying a plane and most of all teaching the young our commitment to their well-being. sister, daughter, grandmother, friend...I am a child of God!